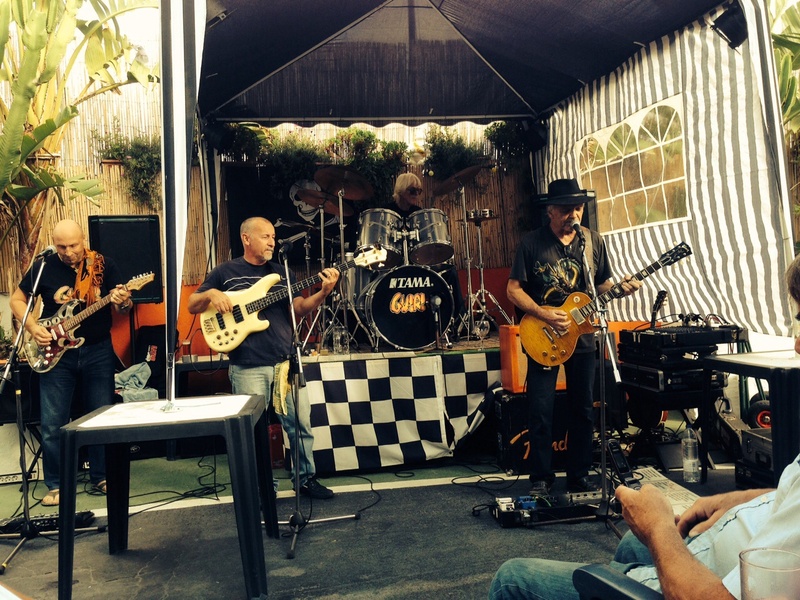 Yesterday I took a rare trip down the mountain to the coast, with two main objectives (1) to look for some plants to put on one of the terraces that I rebuilt this year and (2) to visit the music venue ‘The Racingclub Axarquia’ to see my favourite local band Guiri. We are still enjoying exceptionally good weather here in Andalucia (although there are rain storms promised tonight and tomorrow morning – bring it on – we can certainly do with the rain, I just wish it would come without the strong winds that are also forecast). So, we gave Liana an early lunchtime snack and left an indignant Roly with some doggy treats and trundled down to the coast at Torrox and my favourite garden centre ‘Viveros Amberes’ which has been transformed into a very sophisticated establishment since I last visited a few months ago. The deal was done, my prize was rather unceremoniously bundled into the car (luckily our Renault Kangoo is very accommodating) and, with me grinning from ear to ear, we drove around the corner to the Racing Club. This music venue is in a strange situation on a main through road, and although we have passed it many times, we have never previously visited. There are so many opportunities for live music here in Cómpeta that there doesn’t seem much point in driving to the coast for it. But the pull of a visit to the garden centre and seeing my favourite band was enough to prize me off the mountain. We were delighted to see some friends from Cómpeta sitting in the club when we arrived and then another couple of great chums arrived soon after – all six of us experiencing our first time at the venue – and all of us drawn by the promise of great music from a well known band. The event was set up on the terrace and even at the beginning of November I didn’t need to put on the denim jacket I had brought ‘just in case’. Though it seems this is the last weekend that will be hosted outside, next week the activities will be under cover. The place is only open at weekends, I’m not entirely sure of the setup but I think that on Saturdays there is a feature band and an open mike jamming session, and on Sundays the featured band plays alone. Hours are from 2pm, music starting at 3pm. We sampled the food on offer which was good, a selection of simple meat with chips dishes and some very tasty looking pizzas. After a while (and probably a drink or two) many of the audience took to the floor and danced the afternoon away to the great music belting out from the stage. It was a fabulous afternoon and I shall definitely be tempted off the maintain for a return visit. And now, a day on, my feelings for my new love are still as strong as they were at first sight, and I just have to make a decision as to where to plant my beautiful new olive cloud tree, and then watch it grow. 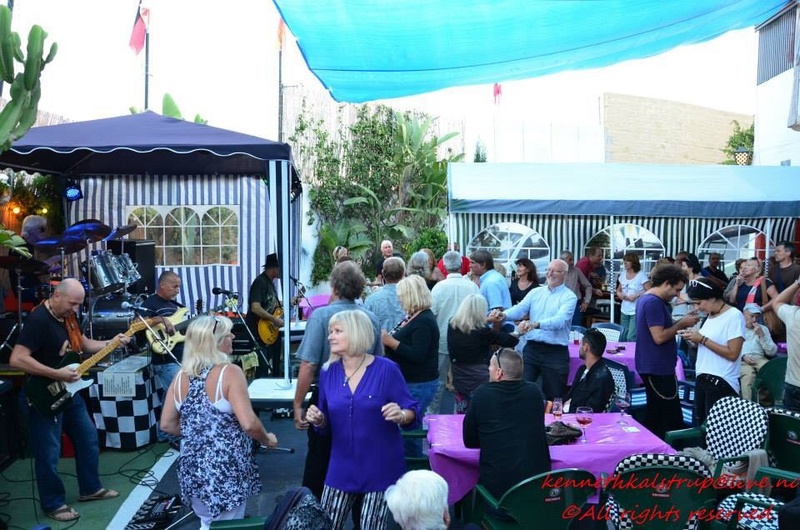 Of course it isn’t appropriate for the terrace that I went shopping for….so maybe I can combine another coastal sortie to the garden centre and catch another great band at the Racingclub Axarquia. 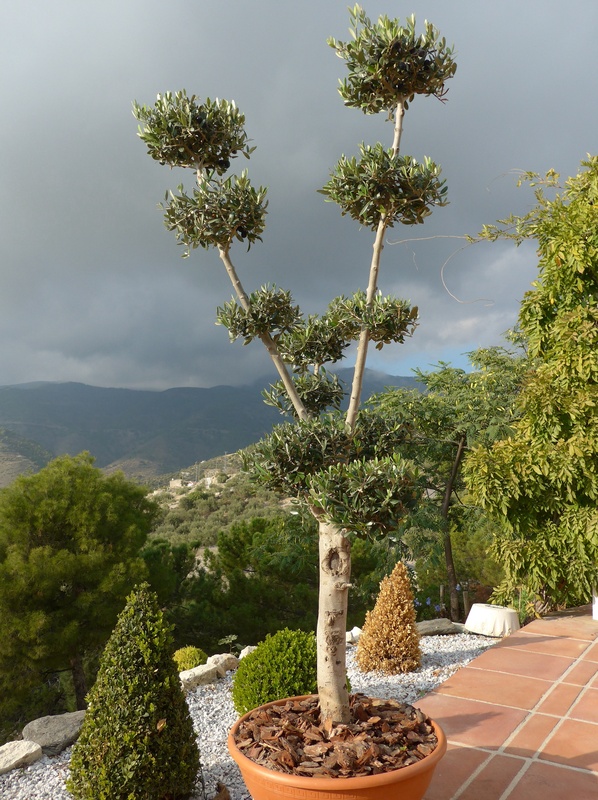 This entry was posted in A view of life, Expats in andalucia and tagged Cómpeta, Guiri Andaluz, Olive cloud tree, Olive Pom Pom tree, Racingclub Axarquia, Torrox, Viveros Amberes. Bookmark the permalink. At 2m tall it only just fitted in the car with the top alongside Maggie’s head. The look on her face was something to behold. Guiri are a true rock band that is always worth listening and dancing to. I had to skip the rest of your post to see your acquisition. It has real personality! Great post Maggie. I was thinking about you only yesterday! I have a baby version of your magnificent olive tree that I got for my birthday. It is very much the poor relation & less than half the size, but I still love it. This weekend it comes with me to Dublin where I have reserved a spot for it in Mam’s conservatory for the winter months! OOHHHH … I had to scroll to the bottom of the post first in the hope of finding what you bought! Your new acquisition is amazing! No wonder you fell in love with it. Sounds like such a perfect happy day! Enjoy your new beauty! Don’t let the winds tickle it too much!